A wonderfully peated and iodized Single Malt in the Islay style. The first distillation of the peated Longrow Single Malt has been carried out as a trial, for the first time in 1973, when the President of Springbank distillery wanted to prove that he could produce a peaty whisky in the Islay style, but on the continent. This trial resulted in an amazingly well crafted, successfully peated and iodized whisky that quickly became a standard product of the Springbank range, with yearly distillations since 1990. This whisky was named after the former Longrow distillery located near Springbank. The barley used in the Longrow production has been entirely dried on a peat fire, which accounts for the wonderfully smoky character of the malt. This Single Malt in a combination of 6 to 14 year-old whiskies, aged in various casks that previously contained Sherry, Bourbon, Port and Rum (50 to 550 liter casks and pipes). This results in a creamy spirit, with notes of smoke, iodine, flowers and spices (red peppers, paprika). Created by Archibald Mitchell in 1828, Springbank has always been run by the family. Archibald is the great grand-father of the current owner. From the beginning, Archibald Mitchell’s knowledge has been recognized and his malt was sold at high prices to the blenders of that time. Thirty distilleries or so operated in Campbeltown, when the town only had 1969 inhabitants. One of the main characteristics of the whisky produced in the area is their peat flavour, similar to the neighbouring Islay style. As peated whiskies weren’t so much appreciated by blenders in the mid-19th century, Springbank was one of the first distilleries to dry the malt partially over a charcoal fire. Business was good was Campbeltown distilleries, up to the Great Crisis of 1930. From that date onwards, many distilleries closed. Springbank was not exception to the rule and shut its doors for many years. The distillery went through very few changes since its creation. Springbank is one of the few distilleries to overlook the complete malt production process. The fermentation process is quite slow, ad made in wooden washbacks. It lasts about 70 hours. The Springbank distillery has its own bottling chain. It produces three different malts: the first one is called Springbank and distilled twice and a half... The malt is dried during 6 hours over a peat fire and then 24 hours in hot air, resulting in lightly peated malt. For the distillation, the wash is distilled a first time and the head and tail of the distillates are separated from the body. Then, a part of the low wines thus obtained is distilled again, and again separated from the distillate’s head and tail. The feints eventually obtained are distilled in the spirit still with the low wines of the first distillation. The spirit is then matured in various cask types or refill casks: Bourbon, Rum, Madeira or Sherry. 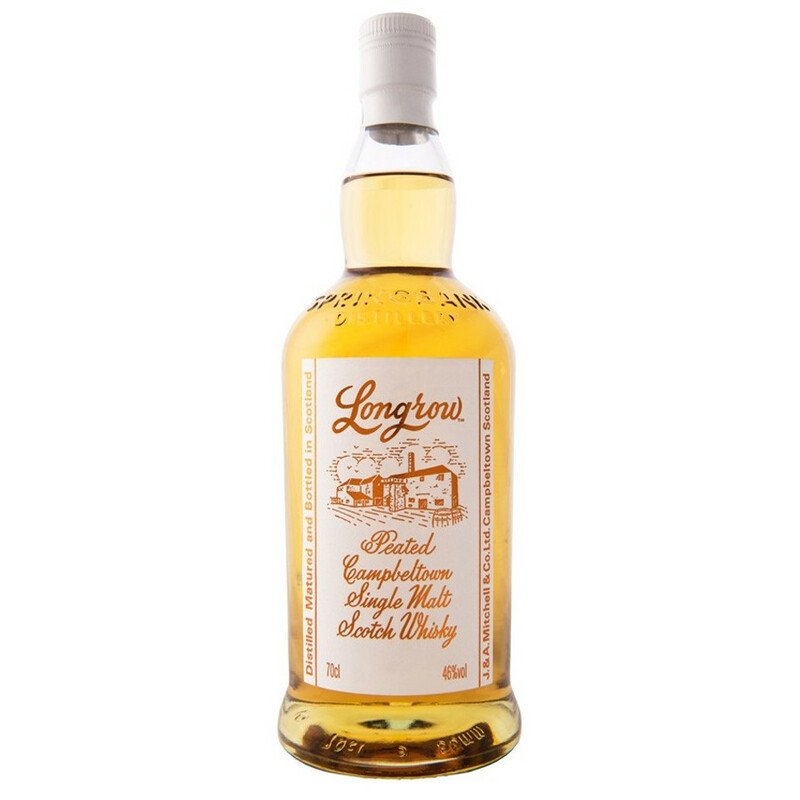 The second malt produced by the distillery is the Longrow malt, named after a old neighbouring distillery closed in 1896, which last remaining cellar covers up the bottling chain of Springbank. This malt is entirely dried over a peat fire. The peaty taste of the whisky is much more prevalent. Longrow is distilled twice, and sold in its 10 year-old version. A 15 year-old version is on the way. The Longrow production resumed in 1987, and only matured in refill casks. In 1996, Springbank started distilling a third malt, firstly sold in its 8 year-old version. This malt is called “Hazelburn”, deriving its name from another distillery which closed its door definitely in 1925. The malt destined at the Hazelburn production is exclusively dried over a peat fire. About 70% of the production goes to Single Malt bottling, the rest contributing to Campbeltown Loch and Mitchell 12 Years blends. Nose: very creamy, just like custard. Smoke slowly develops without prevailing on other aromas in the glass. Opens on roasted marshmallows, herbs and rich fruits. Palate: perfectly balanced, rich and creamy with a hint of iodine. The smoke is still strong and overflows the mouth just like smoky whiffs from a chimney fire. Finish: the smoke lingers around with a pleasant sweetness.